The left and the mainstream media never miss an opportunity to cry sexism and misogyny if a female politician is criticised. It happened endless times in Australia when Julia Gillard was Prime Minister and also throughout Hillary Clinton’s failed Presidential run. The new darling of the feminist sisterhood is New Zealand Labour leader Jacinda Ardern. They were outraged that during her first day as leader she was asked about her plans to have children, even though it was an issue she had raised herself only months ago. Looking at Ardern’s performance in the three weeks that she’s been leader it would appear her gender (or her age for that matter) hasn’t hindered her or party’s chances in the upcoming election. In fact, she is proving to prove herself capable of pulling off one of the greatest political miracles in recent times. She has rescued the Labour Party from near electoral oblivion three weeks ago to nearly being neck and neck with the incumbent National Party government under Bill English in the latest poll. Many are commenting that the Labour Party looks united for the first time in nine years. If there is a patriarchy, it doesn’t appear to be doing a good job. But despite her success and the electoral goodwill generated towards her dubbed ‘Jacindamania’ the feminists still believe she is a victim. The outrage was sadly entirely predictable with #lipstickonapig trending on New Zealand twitter with prominent New Zealand female media personalities tweeting photos of themselves putting lipstick on. In fact the comment was so scandalous that it has made international headlines with Australia’s ABC and Al Jazeera reporting on this alleged sexist comment. Prime Minister Bill English, obviously terrified of being called a misogynist described the tweet as “deliberately appalling”. 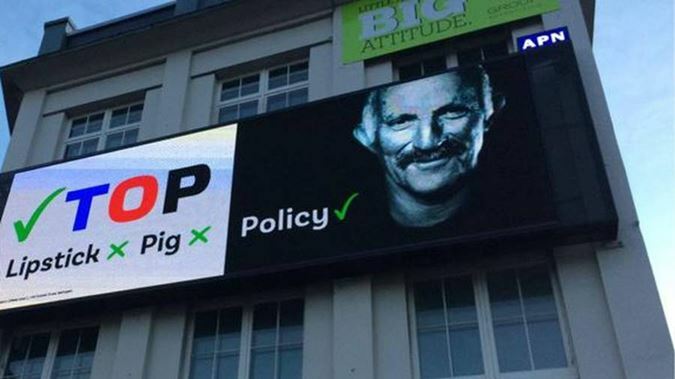 But to Gareth Morgan’s credit he has not succumbed to the confected outrage, instead putting the tweet as a slogan on a party billboard with has the words lipstick, pig and policy. A few things need to be considered in this alleged scandal. First the fact that Morgan is not a far-right political candidate. His party has been described as one of ‘radical centrism’ as it supports the universal basic income and abolishing the use of fossil fuels by 2050. 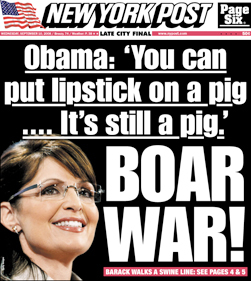 It should also be noted that ‘lipstick on a pig’ was a line used by candidate Barack Obama in 2008 to refer to John McCain’s selection of Sarah Palin as his running mate as he said ‘You can put lipstick on a pig. It’s still a pig’. Of course, since Obama was the left-wing messiah this did not affect his campaign at all. Plus ‘lipstick on a pig’ is not even a political line that is intended to denigrate female politicians. The line is designed to highlight when political parties or campaigns make superficial or cosmetic changes in a futile attempt to disguise the true nature of what they are pushing. Morgan pointed this out himself and said he was referring to a “meaningless face-lift or makeover” by Labour. It is certainly correct for other politicians and the media to scrutinise more carefully the policies of Jacinda Ardern and Labour and to make sure they cannot ride to power simply on the back of Arden having the wow factor. This has been the same criticism leveled at similar male political leaders such as Canada’s Justin Trudeau and France’s Emmanuel Macron. The vote for me because I’m a women slogan is becoming tiring, but to give Arden credit she herself as not played the woman card, but rather others have done it in her name. Arden is no victim of sexism, in fact politicians around the world are most likely envying her miraculous political rise and almost faultless campaign so far.